The American economy, workforce and labor movement of a century ago were radically different from those of today, but there is at least one parallel: high levels of immigrant workers who are employed at the lowest paying jobs while working in the most difficult conditions. These parallels were the topic of discussion throughout the 100th anniversary of the deadliest labor dispute in American history, the Ludlow Massacre, at SF State Friday. 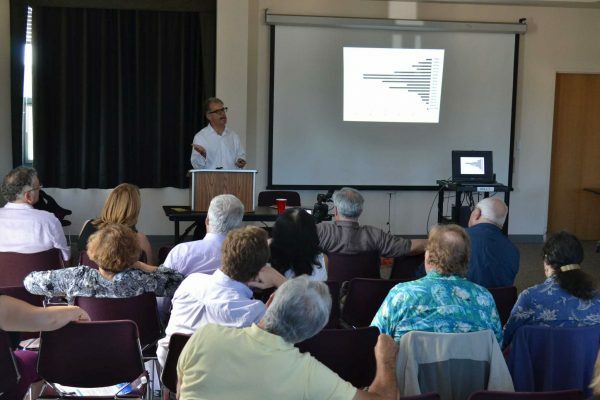 The modern Greek studies department, with help from five other departments and the Labor Archives and Research Center, organized a colloquium to highlight the importance of educating the next generation about the history of the American labor movement. Friday, October 3, Speakers gather at SF State to commemorate the 100 year anniversary of the Ludlow Massacre, an attack executed by the Colorado National Guard against a camp of unionizing coal miners and their families. Here, Professor Kostis Kourelis of Marshall College speaks on the Greek Diaspora, in relation to Ludlow, and the Greek miners who worked there. Helen Tinna / Xpress. Thousands of striking coal miners in southeast Colorado culminated in the infamous event of April 20,1914, which resulted in the death of dozens of the miners in addition to 11 children and two women living in a nearby tent city. After months of striking, the National Guard was called in to break the strike, and the guardsmen set the tent city on fire, said Thomas Andrew, Colorado University associate history professor. The strikers, who were mostly Greek immigrants and organized by the United Mine Workers, made around $400 a year, according to SF State alumnus and keynote speaker Zeese Papanikolas. The miners also faced dangerous and sometimes deadly conditions, Papanikolas said. News of the dispute traveled to San Francisco, which already had a reputation as a strong union town. Both labor and business leaders in the city sympathized with the striking workers. The Rockefellers, who owned the mines, were sharply criticized in the San Francisco press, director of the SF State labor archives Catherine Powell said. Papanikolas compared the coal miners of 1914 to today’s retail and tech workers who are mostly non-union, can be hired and fired at will and face competition from immigrant workers who are willing to work for lower wages. Labor unions represent only seven percent of private sector workers today, according to Powell, the same percentage as in 1914. While the approximate 40 speakers, students and professors at the event reflected on a time when labor disputes were much more violent, there was also anxiety about the future of America’s current labor movement. While unions have been under attack, there is still labor activism, often involving immigrant workers, Powell said. “I’m not seeing a lot of young people who are interested in the labor movement,” said Elliot Gorn, a history professor at Loyola University in Chicago. “You just try to get educated and get the best job you can. Young people are taught to think in terms of working for themselves,” he said. This year, Andrew’s organization, History Colorado, sponsored a series of events to commemorate the strike and massacre. History Colorado is also compiling a package of education materials that can be used in Colorado classrooms to teach labor struggles in the state.